Many times, when we hear success stories of inspiring individuals, we cannot help but compare ourselves to them. How did they have the time to do that? What is their secret? How did they stay motivated? Wondering about that could be a good thing. If your intention while doing that is to evaluate yourself and see how to improve and be further motivated, then give yourself a pat on the back. When it comes to material aspects, as Muslims, we should look at the people below us and not be greedy. However, when it comes to religion, we should look at the people above us. They should be our role models, our goals. Our interviewee today is Dr. Mohamed Abutaleb. He is well known for his inspirational talks and lectures that increase people’s faith and help them put life in perspective. 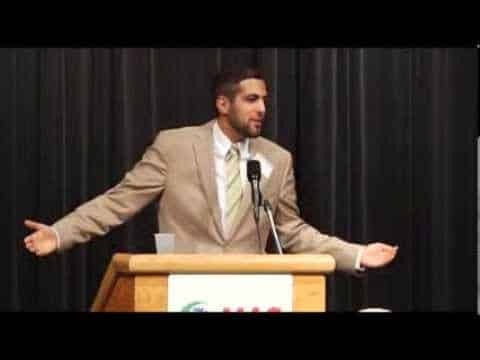 Despite his young age, being in his 30’s, Abutaleb is a hafiz of the Qur’an, has a PhD in Electrical Engineering from the Massachusetts Institute of Technology in addition to degrees in Computer Science, Physics and Mathematics. He also serves as the Imam of the Islamic Association of Raleigh in the United States. Memorizing the Qur’an and earning a PhD from one of the highest ranked universities in the United States are two successes that took years to achieve. Sometimes, our end goals are really far and cannot be seen. When the results we are aiming for are not shown immediately and many barriers seem to be in the way, we tend to lose motivation. 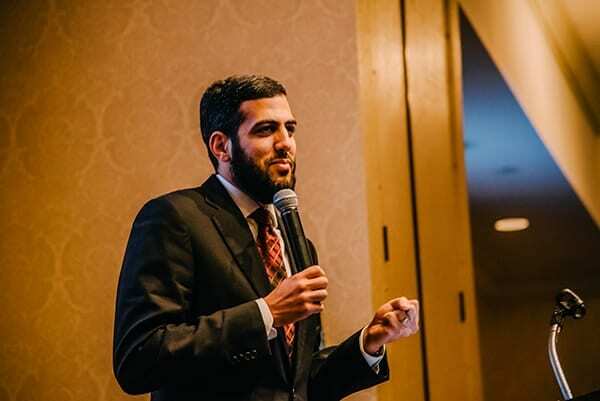 Dr. Mohamed Abutaleb began memorizing the Qur’an at the age of 4 with volunteers. However, he was a teenager the first time he recited the Qur’an in front of a sheikh with knowledge in recitation. At that point, he realized his memorizing progressed slowly and his recitation lacked tajweed, and therefore, he had to restart his memorization. There is no doubt that Dr. Abutaleb had barakah from Allah in his life in order to fulfill some of his goals and have a productive lifestyle. In this interview, we learn more tips from him hoping to get inspiration and motivation to fulfill our own dreams as well. 1. Memorizing the Qur’an is the dream of many Muslims out there. In your journey, did you ever stop memorizing the Qur’an or temporarily give up? No, I never stopped memorizing, but I never did it full time. I believe consistency is most important while memorizing. When I was a teenager, I met a sheikh at a time where I had not made much progress. He smiled at me and asked if I was taking a vacation from the Qur’an. His smile and sentence never left me, and it impacted me deeply. I realized that I was giving myself low standards. The most important step is to start. You are not in a race. Even if you aren’t as fast in memorizing as the others or as smart as the others, just start! 2. How was your journey of memorization? It was a beautiful journey, but not a perfect and flawless one. It is important to be aware about realism and practicality. There will be times for you that are better than others. It will come and go in your life. It is a continuing struggle, but a beautiful struggle. It took me 7 to 8 years to memorize the Qur’an; it was slow, but it was worth it, alhamdulilah. 3. Did people encourage you to go another direction? I almost never started with the sheikh that helped me memorize the Qur’an because of glittering reasons. The sheikh was in high demand, because he was the only one in the area, so he would only be able to sit with us two hours a week. Many people told me not to bother, since two hours was not enough time. Also, I thought I was already too busy since I was in an advanced technical program at school. I was literally a finger length away from not starting, but then my mother told me to give it a try and that I had nothing to lose. I am so grateful to Allah that I did. 4. How did your life change after you memorized the Qur’an? A direct change I encountered was that I sharpened my connection with the Arabic language. I was born and raised in the United States, so for me, learning the language of Qur’an was learning a foreign tongue.. Secondly, when you have the Qur’an in your life, you scrutinize yourself to your errors, discipline yourself and hold yourself accountable; it is a fragile gift. It cannot be attained or retained by misconduct. The journey of retaining it for the rest of your life is much more difficult than when memorizing it. Memorizing the Qur’an is like having a gift that you have to be worthy of having in your life since Allah has blessed you with it. 5. How did your connection with Allah change after you memorized the Qur’an? Learning the Qur’an made me ponder about the meaning of my life. I learned what it means to implement the teachings of the Qur’an. The blessings of the Qur’an cannot be counted; they are numerous. For example, when you are in the company of a parent or someone you respect, you want to behave accordingly. Memorizing the Qur’an is as if its wisdom is always in your company. 6. What was the source of your motivation in college? My parents always had a heavy emphasis on building the love of education in me since I was young. What really amplified my motivation was seeing the religious aspect behind that. The tragedies of September 11 really showed me that. When you have already excelled in school, people would perceive your connection with being a good student to your religion, especially when carrying the name ‘Mohamed’. I believe students and professionals are able to touch more people in the academy and work place than an Imam will be able to. When that meaning really crystallized in my life, it pushed me to another level to excel to the best of my ability. 7. Were you productive in college or did you procrastinate? Both. If there is an ideal or perfect student, I wasn’t it. There were times were I would cram my studying and not perform my best in exams. However, I would dust myself off and try to get back to a level of Ihsan (excellence). There are certain standards students hold for themselves such as getting straight A’s or performing to a teacher’s expectations. However, all the tables turn and standards change when you realize you do it for the sake of Allah . I realized I should always pursue ihsan (excellence and beautifying one’s conduct). Even when I procrastinated, I would realize I should expect more of myself because of that standard. Pursue ihsan and that with patience, dua, and perseverance, Allah will open more blessings for you. Never be satisfied with where you are. 8. What was the hardest challenge you faced in your education? Beginning school was tough for me. I was essentially a student at full time load, working full time load, and working to retain the Qur’an. My time was squeezed to a whole new level, which has never been done before. I was given advice that “when you have an objective, keep moving to that objective, even if you lower the faucet to a drip”. At that time, I was getting speaking invitations for conferences, which I couldn’t act upon since it wasn’t the right time. It was frustrating and uncomfortable not being able to do more on the Islamic part. That advice supported and pushed me to shift my balances positively. Always have a minimum that you never go below. 9. How do you see the relationship between Muslim youth getting educated and the spread of Islam? Here we are in the 21st century, and polls show that 60% of people have not personally met a single Muslim. This means that people are getting their definition of Islam from the media and its portrayals. Muslims need to recognize that the impact they make in silent actions can permute people’s hearts more than a thousand speeches could. If every person personally knew people who lived in the spirit of Islam, then no one will ever accept the negative portrayals of Islam coming from the media. Such interactions with Muslims and non-Muslims happen in the academy and work environments. Make an effort to spread a positive message of Islam. 10. How do you balance being a husband, father, son, Imam and the other tasks you do? There is a hadith for the Prophet that talks about giving each of your roles your attention. Do not try and excel in one role by stepping on another. A really important thing that the ummah is blessed with is the early hours, as hard as it is to leave your bed in the morning. There is no better way than to start in a productive way. Start and end your day with a portion of the Qur’an. 11. What are some challenges you face in your typical day? A big challenge is to make sure that interruptions and notification don’t affect you. Things always come up being urgent or seeming urgent. What helps me deal with these interruptions is to build systems of accountability. This helps you become disciplined and helps make sure that the day doesn’t go wasted because of these interruptions. Strategic things are the second challenge; these are things that don’t have deadlines. This is a great challenge for leaders since they don’t make time to do the things, such as reviewing the Qur’an — that got them where they are. Leaders still have to make sure to invest time in their family, worship and their education. 12. What are you doing now with your knowledge to serve the Muslim ummah? Something really excited I am working on is the ‘Imam’s Initiative as Behavioral and Mental Health’. Our community grew from small families, but we are a much larger community now. However, we are still in that model of relying on the Imam for everything. Now, we have professionals in our community such as marriage counselors, coaches, psychologists and psychiatrists. We have an all-star team. We are all looking at how we can look at this situation get the best support for our community to be better Muslims. Another thing I am really excited to be working on is an initiative on Islamophobia and Racism. We are hands on in the community meeting people and trying to educate others about Islam and Muslims. Every week, we have groups from the government, schools, and communities who visit the mosque. You can see the groups enter with visual discomfort and tension. It is easy for Muslims to feel victimized. Then, I remember that if Muslims were really how they are portrayed in the media, I wouldn’t even want to be from them. It is like witnessing a miracle when their reactions change after seeing us perform salah, people joking around and children playing. 13. What is some advice you can give Muslims who are on a long journey towards accomplishing their goals? Be patient and productive. Break your big tasks into bite-sized pieces. This is an important part in achieving success and productivity. It can be demoralizing when your goal is far and you cannot measure how long you need to finish. For example, instead of thinking of the whole Qur’an, think of it as juz’ by juz’. The concept of gradualism is big in Islam. We have unrealistic perceptions of successful people who we think were born this way. We think people have something that we lack. Allah could have created the world in an instant, yet He did it in six days. We have to embrace gradualism. People don’t achieve successes except through a thousand mistakes. A healthy approach to gradualism is to praise the outcome less and recognize the tools and journeys more. Titles such as hafiz, scholar or professional merely highlight the things they have and we don’t. If we follow the course gradually, Allah will give us more blessings. Build a support network. Allah says in the Qur’an, “And keep yourself patient by being with those who call upon their Lord in the morning and the evening, seeking His countenance. And let not your eyes pass beyond them, desiring adornments of the worldly life, and do not obey one whose heart We have made heedless of Our remembrance and who follows his desire and whose affair is ever in neglect. [Qur’an: Chapter 18: Verse 28] Allah emphasizes the importance of companions. There were many nights that I didn’t think I was going to make it through graduate school. Allah is the best reliance and support, but I am thankful to have my family, friends and mentors who helped me pass those trials. Surround yourself with excellence. You shouldn’t be the best person you know. Being productive means to put people around you that are better than you, whether in Qur’an or school. Let them be your human figure of ihsan so that they set a higher level for you. It is dangerous to believe that you are at your best level. Find people who put you in awe in some aspects to be your encouragement. This is incredibly important. You have to learn how to embrace the ups and down. Even when my Qur’an teacher couldn’t attend class, the students and I were still expected to preserve our memorization. The company of a teacher and other students was very helpful in building that individual journey. No one can ever be above the righteous companions and teachers. Knowing that will help a person regulate themselves. If you’ve benefited from this article and decided to change a thing or two in your lifestyle, tell us about it in the comments section. Feel free to share your thoughts with others so that all can learn.